In this Ultimate Guide To Upcycling Pallets, you'll discover that pallets are excellent material to upcycle into many projects. They can be as simple as a shelf, to an entire shed or even a home! Plus, they're also readily available all around us. We at 1001pallets.com think our website proves that much for sure! Pallet Safety - the most-referenced page on the 'net! Where to find pallets & our pallet classified ads! and my favorite, the ever-expanding Pallet Tutorials page, where you get step-by-step directions, videos, cut lists, drawings, and more - depending on what our kind Crafters are willing to share about their awesome projects. Pallets have the power of turning an ordinary-looking object into a useful, trendy piece of furniture or artwork. Pallet crafts for the home can add an individualized style to your home décor. The Ultimate Guide To Upcycling Pallets below should help you to understand a little bit more about the different types of pallets that are available. We also have provided some typical examples of pallet projects, ranging from easy to difficult/expert level. We hope that the information provided in this Ultimate Guide To Upcycling Pallets stimulates some of your own innovative ideas. 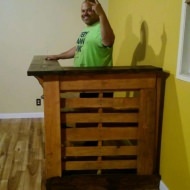 The group at 1001pallets.com hopes that you'll find numerous pallet projects that you want to build and share with our Crafters. And as always, Happy Palleting! Are you convinced? It's now your turn to start your pallet project! To start, do not hesitate to visit our tutorials section where you could find some incredible tutorials to download! If you prefer paper, below are three nice books with a lot of step-by-step instructions to help you, they are available at Amazon. I want to learn the ideas. Fiona: The “EPAL” pallets (European) are debarked and heat-treated and safe to use. Do NOT use the ones marked “EUR”. They have been chemically treated. When picking pallets look for those marked “EPAL”, “DB”, or “HT”. i have quite a few ‘european’ pallets – its a pale wood – i just want to know if anyone else knows, would these pallets be ‘treated’ and if so, are they safe to use? This is fantastic. I need to know where I can find some information how to fabricate pallet furniture. Pyrography Pallet Plant Stands Are Rustic & Gorgeous!